1. 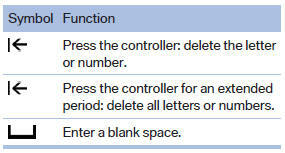 Turn the controller: select letters or numbers. 2. Select additional letters or numbers if needed. 3. "OK": confirm the entry. Entry of names and addresses: the selection is narrowed down every time a letter is entered and letters may be added automatically. The entries are continuously compared to the data stored in the vehicle. Only those letters are offered during the entry for which data is available. Destination search: town/city names can be entered using the spelling of language available on the Control Display.